← A new bar for Brownhills? An Ebenezer Church concert party from the 1920's, kindly supplied by reader David Evans. I’ve had yet another great photo sent in by to reader David Evans. This is a somewhat unusual image From the first decades of the last century, showing a Walsall Wood theatrical group in full stage costume. It’s a rare kind of photo, and if anyone knows anything about it, like who the players are, please do comment. Yet again, I thank David for the time, effort and dedication in his continued support of this blog. He really is turning up some fascinating stuff. Looking through my new replacement copy of Bill Mayo and John Sale’s excellent book, “Memories of Old Walsall Wood” the photo of the Walsall Wood Red Caps band of the 1930s, page 11 caught my attention . 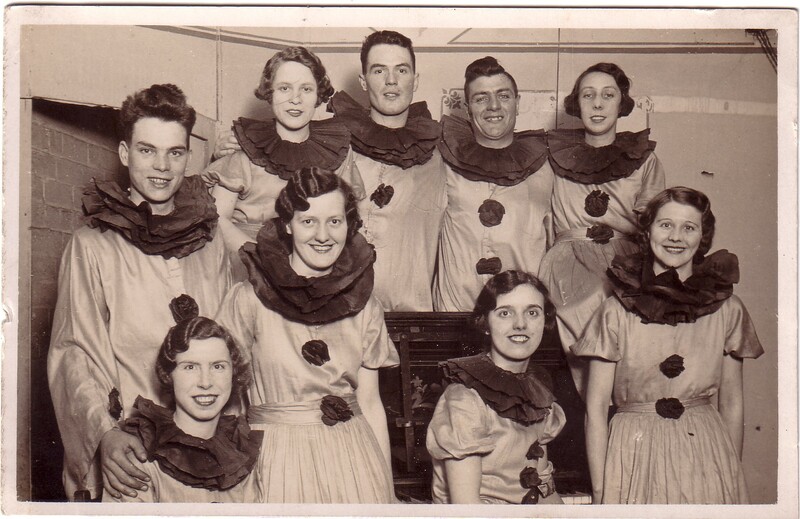 Sorting through my own “clutter” I came across this rare photo… The local churches all had their choirs as did Ebenezer, but in addition, there was this group of keen entertainers. Music, and more especially making their own musical entertainment was an important part of the local society of the day. Most homes had a “Joannah” in the front parlour and most families had at least two people who could play this. Readers might like to consider the national and global events that these good folk lived through in the last century …they were born a few years before the outbreak of the First World War!….and how our modern way of life is so vastly different. This entry was posted in Brownhills stuff, Churches, Events, Features, Followups, Interesting photos, Local History, Local media, Reader enquiries, Shared media, Shared memories, Social Media, Walsall community, Walsall Wood stuff and tagged 1920's, amateur dramatics, amateur theatre, Brownhills, Brownhills local history, Church, concert, David Evans, Ebenezer, Local History, music, New Photos, Staffordshire, Walsall Wood. Bookmark the permalink. many thanks for putting this photo on your site..Names? After the last world war the piano tuner was a Mr Philips from Shelfield , who will be known by many, I think as he was well-respected. What a great photo. Could the creator of Andy Pandy have seen this striking bunch and pinched some ideas? The hairstyles take you back in time to the old movie stars. I remember my Mom having some of those long metal hair clips, used for making those waves…I wonder what future generations will think of our shaggy perms of the 70’s?, probably wet themselves laughing. The lady, bottom left bears a striking resemblance to a young Princess Anne. that lady was a princess..and my mom! Bless you! I look more like the frog in the well,my wife says..! Best wishes Caz and thanks again to you and Bob for the memories.